At Andaz Delhi, each guestroom is thoughtfully designed and decorated with locally inspired details, and each room contains one of 401 unique artworks inspired by Delhi. Sophisticated details such as wooden floors create a residential comfort, while modern bath amenities and artistic integration invite guests to relax in style. 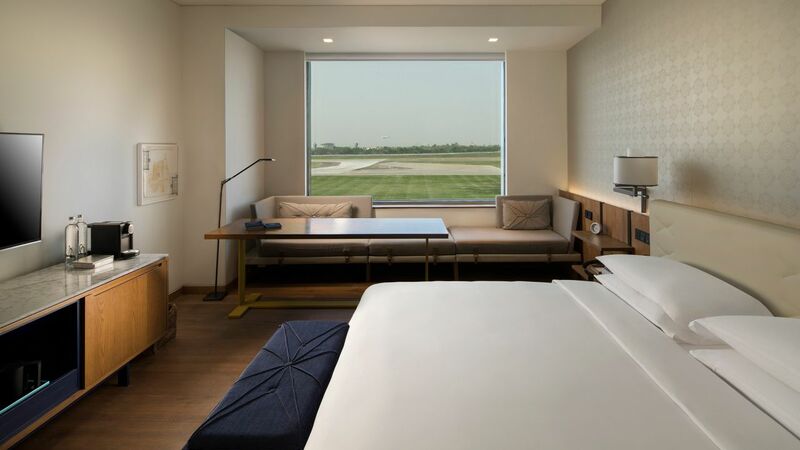 View rooms offer a stunning view of the runway at Indira Gandhi International Airport, an exciting vantage point to watch aircrafts taking off or touching down. 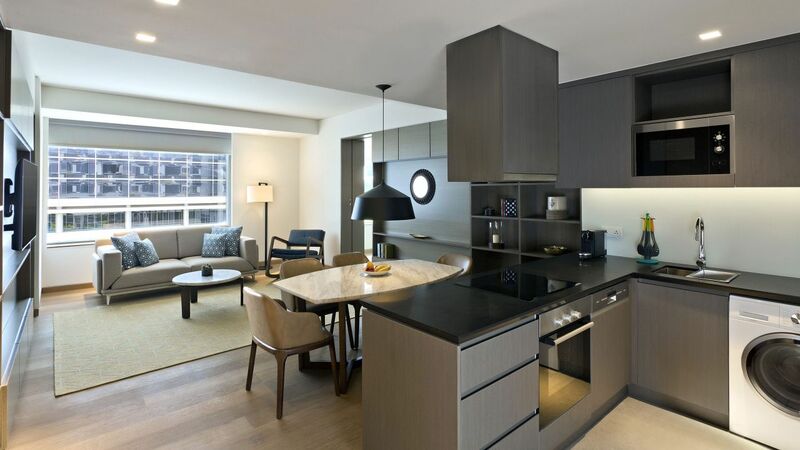 The 129 Andaz Apartments offer residential-style living and dining areas with fully equipped kitchens, available with one, two, or three bedrooms, or in a duplex townhouse. 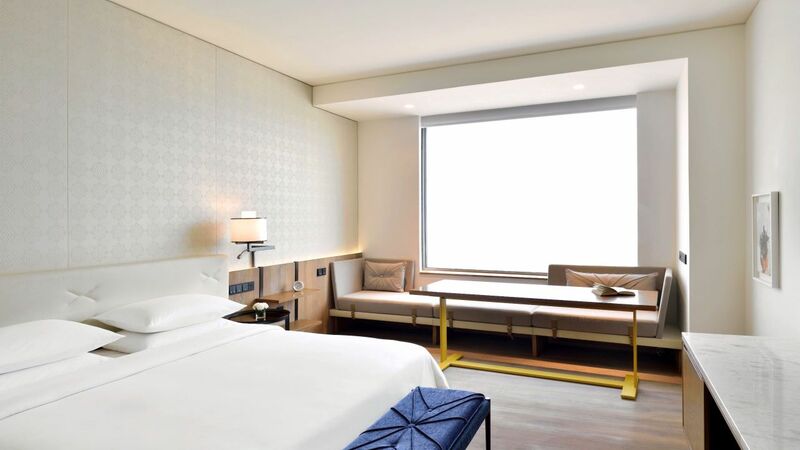 The Andaz Room has 33 - 41 sq m of space with a king-sized Hyatt Grand Bed™, open-plan bathroom, work desk, and a daybed overlooking the courtyard. 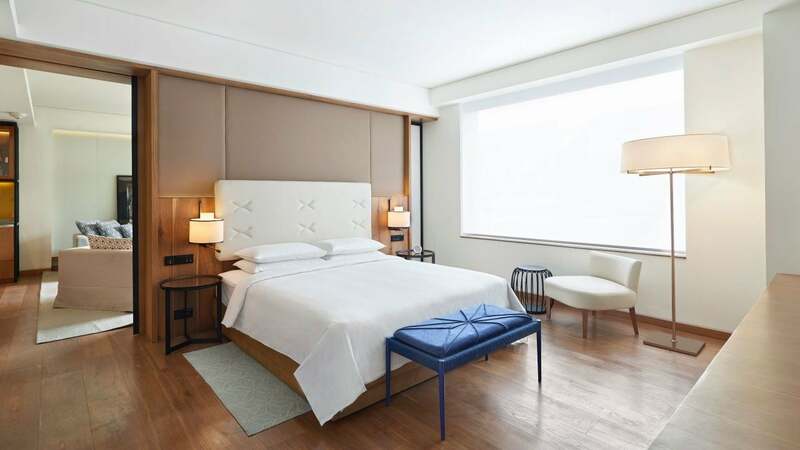 This guestroom has 33 - 41 sq m of space with two twin-sized Hyatt Grand Beds™, open-plan bathroom, work desk, and a daybed overlooking the courtyard. 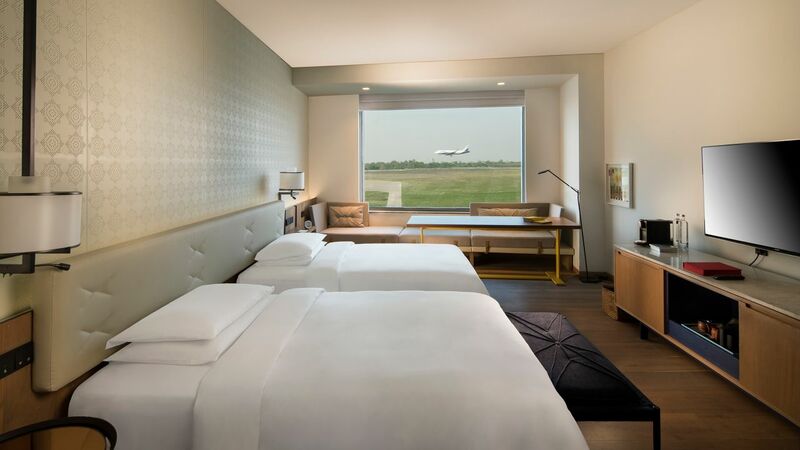 Enjoy a view of the airport runway from your 36 - 41 sq m room with a king-sized Hyatt Grand Bed™, open-plan bathroom, work desk, and a daybed. 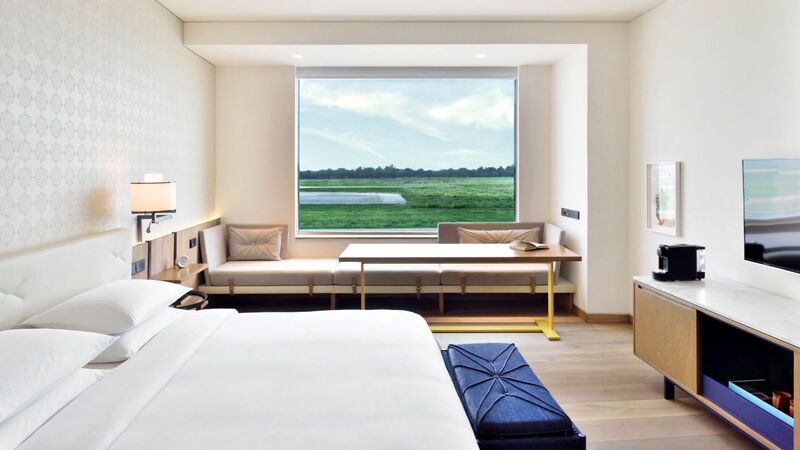 Enjoy a view of the airport runway from your 36 - 41 sq m room with two twin-sized Hyatt Grand Beds™, open-plan bathroom, work desk, and a daybed. 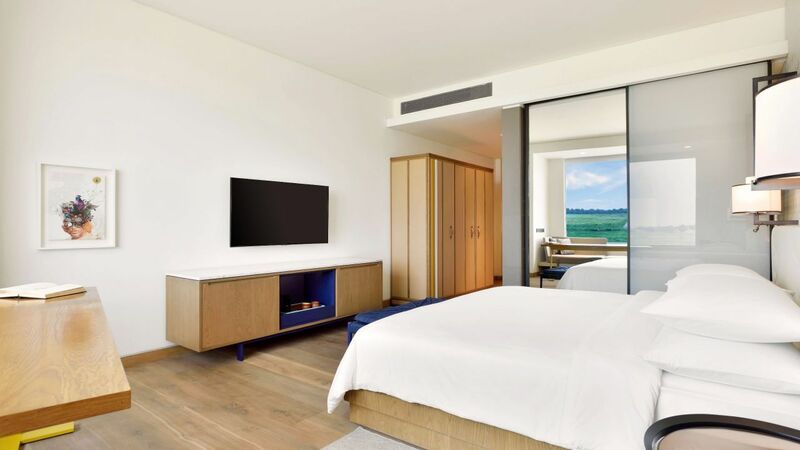 Large guestrooms include 49 sq m of space with one king-sized Hyatt Grand Bed™, open-plan bathroom, oversized desk, and a daybed overlooking the courtyard. 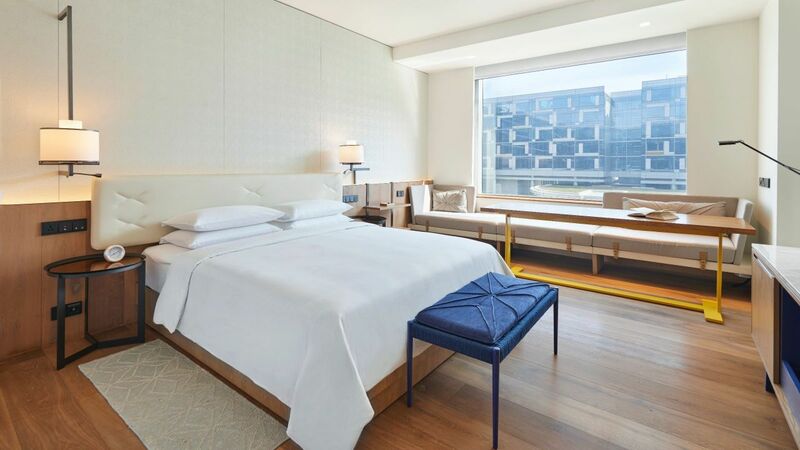 Stretch out in 49 sq m of space with two twin Hyatt Grand Beds™ with an open-plan bathroom, oversized desk, and a daybed overlooking the courtyard. 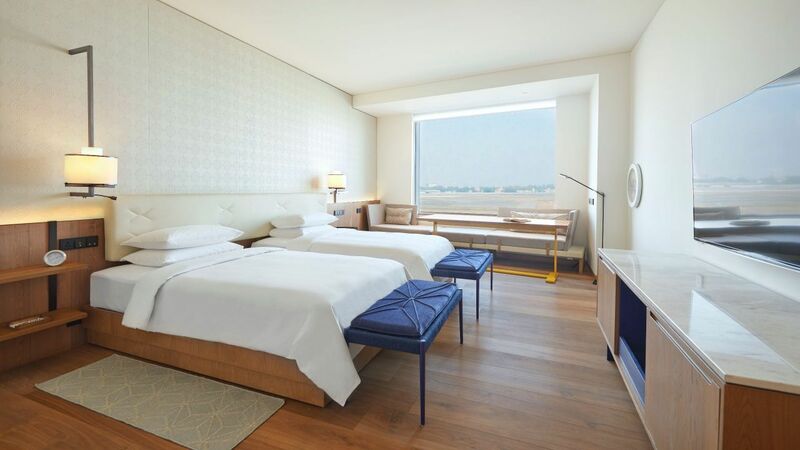 This 46 - 54 sq m guestroom includes a view of the runway, king-sized Hyatt Grand Bed™, open-plan bathroom, and an oversized desk. Take in the view of the runway in 46 - 54 sq m of space with two twin Hyatt Grand Beds™, open-plan bathroom, and an oversized work desk. 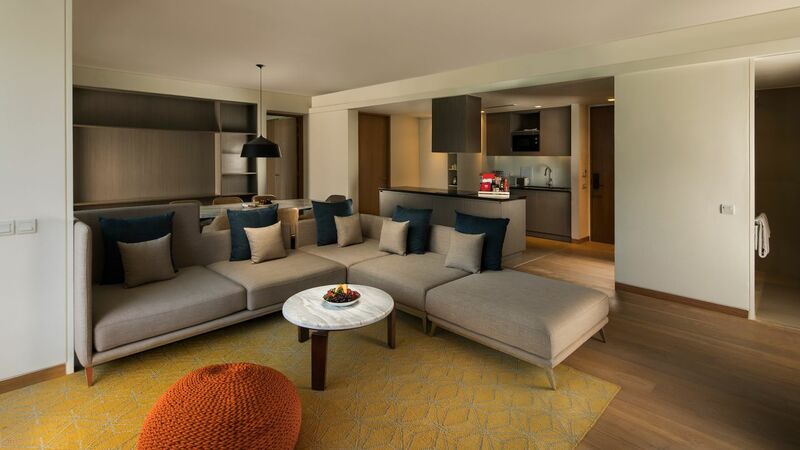 Andaz Suites have 72 sq m of space, including a spacious living room, king-sized Hyatt Grand Bed™, oversized desk, and a daybed overlooking the courtyard. This is a standard suite. See World of Hyatt program terms for upgrade eligibility. 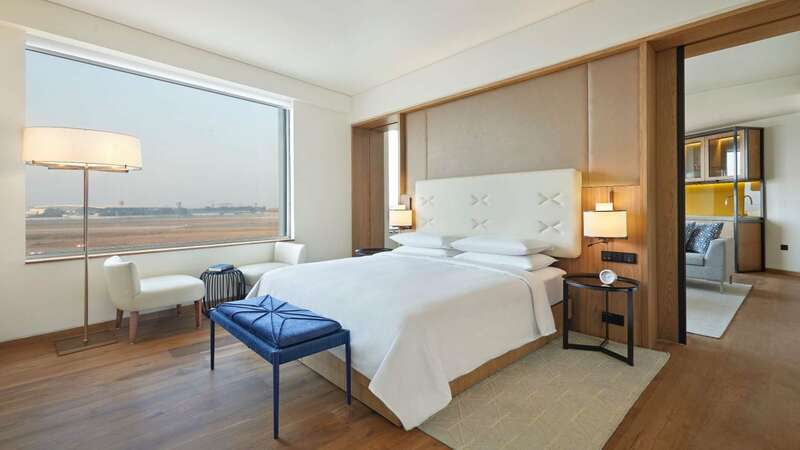 This suite has 74 sq m of space overlooking the runway, including a spacious living room, king-size Hyatt Grand Bed™, oversized desk, and a daybed. This is a standard suite. See World of Hyatt program terms for upgrade eligibility. 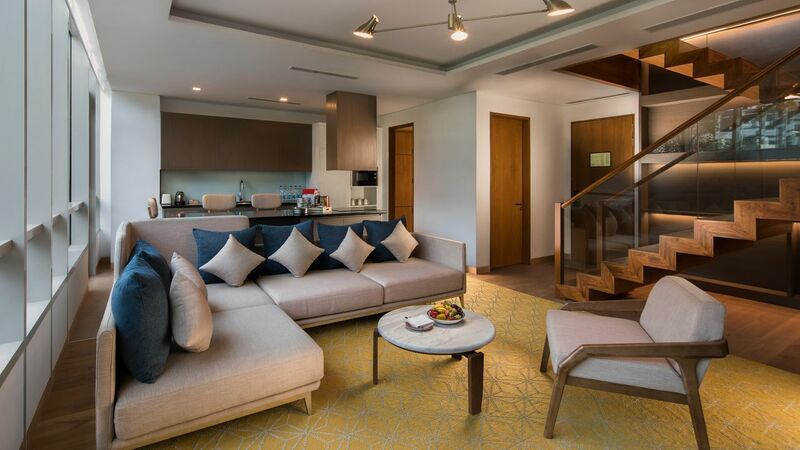 This 83-86 sq m suite includes spacious living and working areas, king-sized Hyatt Grand Bed™, large bathroom, and a daybed overlooking the courtyard. This is a standard suite. See World of Hyatt program terms for upgrade eligibility. 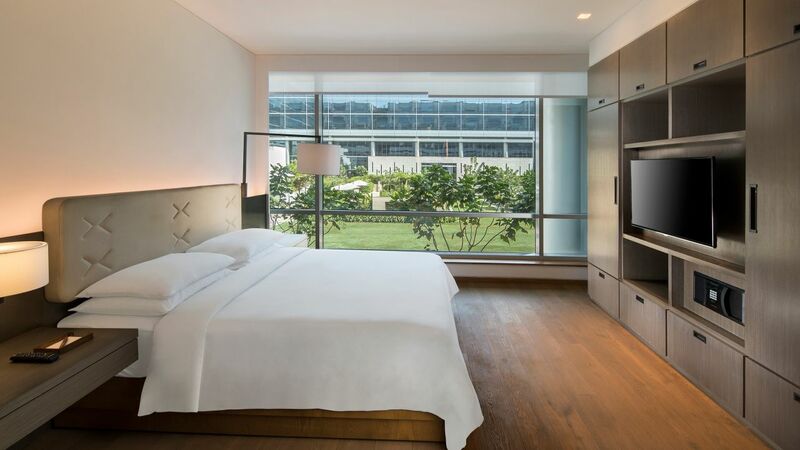 This 81 - 86 sq m suite includes spacious living and working areas overlooking the runway, a king-sized Hyatt Grand Bed™, large bathroom, and a daybed. This is a premium suite. See World of Hyatt program terms for upgrade eligibility. 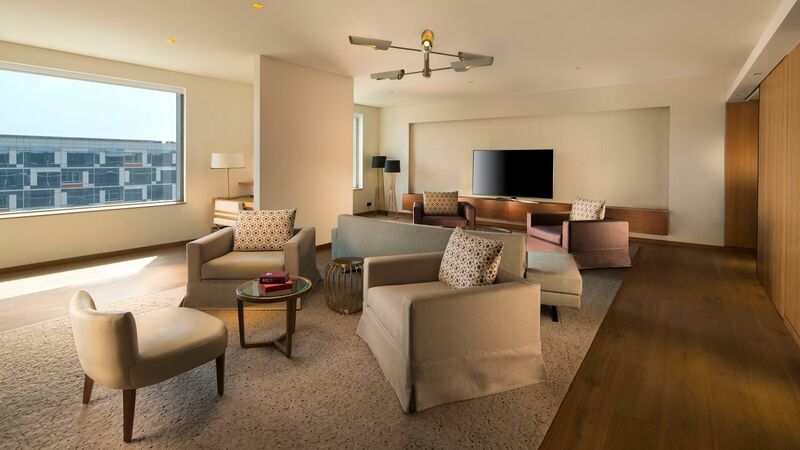 The Signature Suite offers 209 sq m of luxurious space, including separate areas for dining and entertainment. 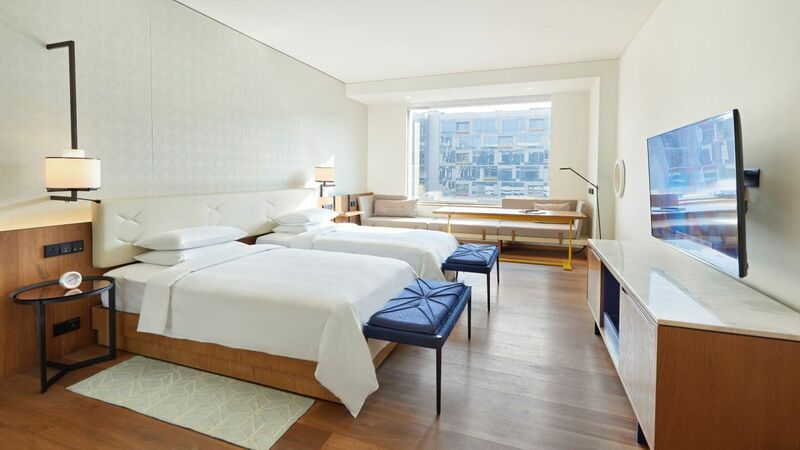 A neighbouring Andaz Twin guestroom (41 sq m) may be added to expand the space further. This is a premium suite. See World of Hyatt program terms for upgrade eligibility. The One-Bedroom residence encompasses an average area of 71 sq m that includes a spacious living area, a dining space, and a fully equipped open kitchen, separate bedroom, attached bathroom, walk-in wardrobes and individual work station. The 45 two-bedroom residences with an average size of 110 sq. m, refine the experience further by offering a view of the runway or courtyard entailing lush green lawns and the serene poolside, while some provide a breath-taking sunset view from their private balcony. 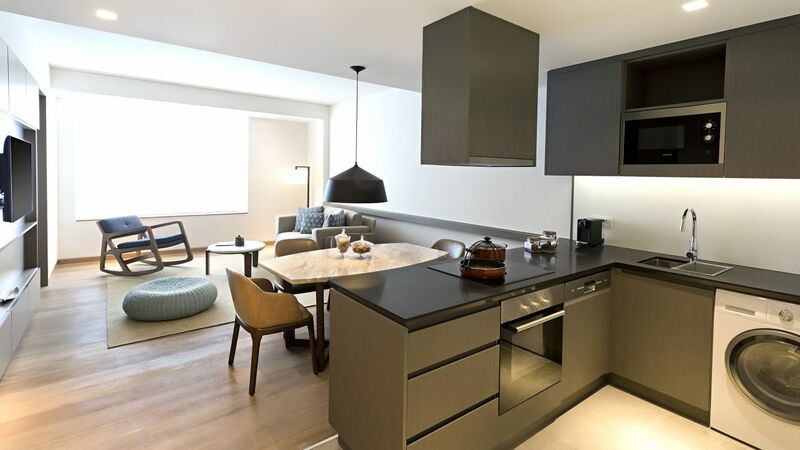 The exclusive three-bedroom residences with a spacious area of 188 sq. m. are a symbol of unparalleled comfort with separate bedrooms, walk-in closets, attached bathrooms with deep sunk-in bath tub and individual vanity units, an all-purpose sofa bed, exclusive lounge seating and an 8 seater dining set. The townhouse duplex apartment offers one king bed, one sofa bed, and one twin bed, as well as three bathrooms and spacious living areas in 154 sq m of space.